THE COSTA ALLEGRA cruise ship finally limped into port yesterday, three days after a fire in the ship’s generator room left passengers without working toilets, running water or air conditioning in a region of the Indian Ocean where pirates are known to prowl. “Things became very primitive,” passenger Gordon Bradwell said after the ship was towed into Victoria port in the Seychelles. The blaze came just six weeks after another luxury liner, the Costa Concordia, capsized off Italy, leaving 32 people dead, a fact that was on many passengers’ minds. Both ships were operated by Costa Crociere SpA, which is owned by Florida-based Carnival Corp. 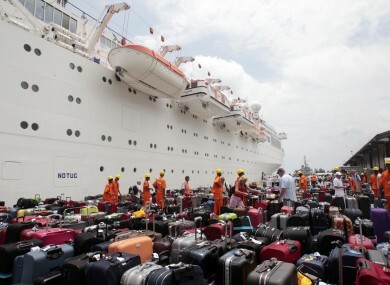 The average age of the 627 passengers on board was 55, said Guillaume Albert, head of Creole Travel Service. Many of the older passengers in particular had trouble with the sweltering heat. After the first hours of chaos an emergency generator not involved in the fire also failed, leaving the ship with only six hours of battery power. That brought an end to any semblance of the good cruise life. There were no more hot meals, only cold sandwiches. The water used to extinguish the fire flooded the galley between the first and second decks. The toilets couldn’t be flushed, blanketing the bathrooms in stench. Cawan Finn summed up the bathroom situation using a British slang expression. “I haven’t had a whoopsie for about four days now,” the 65-year-old said. Stiekema, the Costa vice president, said the company had made the passengers an “extremely fair” compensation offer: A refund of the costs of the cruise, any related flights and any spending on board, plus an additional payment equal to the cost of the cruise and associated travel expenses. Passengers were also given the chance to remain in the Seychelles for a free one- or two-week vacation, which the company said about 70 percent of guests had chosen to do. All passengers were to be flown home at company expense. Guests not staying in the Seychelles were to be flown to Paris, Rome, Milan, Vienna and Zurich, arriving Friday morning. Those passengers will also receive a voucher equivalent to the value of the Allegra trip, to be used on any Costa ship in the next 24 months. “Costa is sincerely sorry for the discomfort caused to its passengers, but happy to have found them in good conditions,” a company statement said. Email “In pictures: Passengers finally escape crippled Costa Allegra”. Feedback on “In pictures: Passengers finally escape crippled Costa Allegra”.